In the New York State and Local Retirement System (NYSLRS), Tier 5 and 6 members have limits on the amount of overtime (OT) we can use in the calculation of their pension. Any OT amount in excess of these limits will get excluded from the member’s final average salary. For Employees’ Retirement System (ERS) and Police and Fire Retirement System (PFRS) Tier 5 members and PFRS Tier 6 members, the OT limit is based on the calendar year; for ERS Tier 6 members, the limit is based on the State’s fiscal year (April 1 – March 31). The OT limit for ERS Tier 5 began in 2010 at $15,000 and increases by 3 percent each year. This year (calendar year 2015), the OT limit is $17,389.11. In PFRS Tier 5, any overtime paid to a member in excess of 15 percent of their regular annual wages can’t be included in their final average salary calculation. This percentage doesn’t vary. The OT limit for ERS Tier 6 began in State fiscal year 2012-13 at $15,000. The limit increases each fiscal year, and is based on the Consumer Price Index on December 31 of the previous year. This fiscal year (2015-16), the OT limit is $15,608. 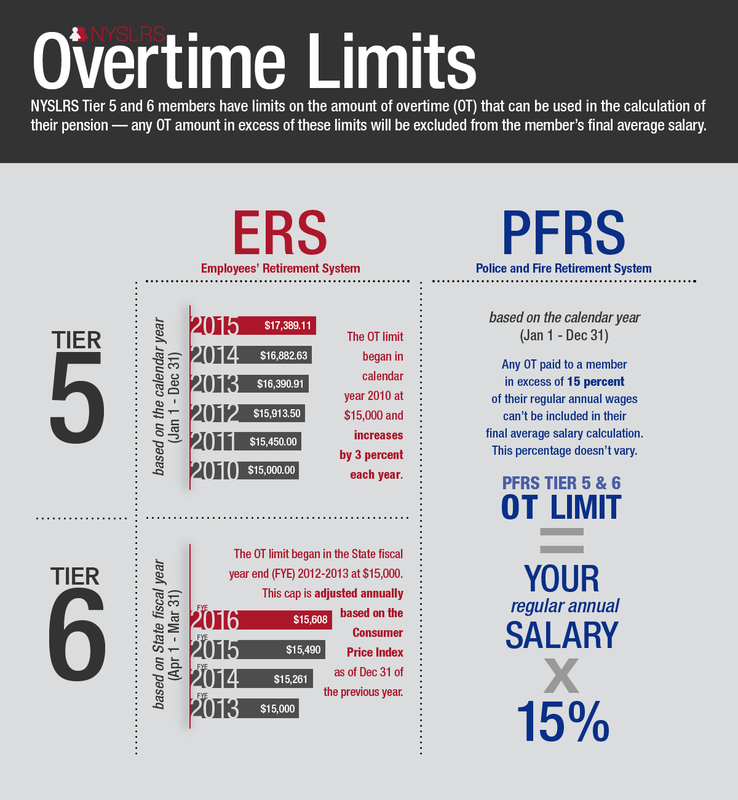 In PFRS Tier 6, any overtime paid to a member in excess of 15 percent of their regular annual wages can’t be included in their final average salary calculation. This percentage doesn’t vary. If you’d like to know more about what can or can’t be included in your retirement calculation, find your retirement plan publication on our Publications Page. If you have questions about overtime and the overtime limit, please contact us. Content last revised August 15, 2018. This entry was posted in General News, Members and tagged ERS, members, New Members, New York State & Local Retirement System, NYSLRS, OT, Overtime, PFRS, Tier 5, Tier 6 on April 15, 2015 by NYSLRS. In the New York State and Local Retirement System (NYSLRS), Tier 6 members make contributions based on their earnings. This means your contribution rate could change from year to year depending on how much you earned in previous years. As of April 1, 2015, there are two ways we determine the contribution rates of Tier 6 members. For your first three years of membership, we base your contribution rate on an estimated annual wage we receive from your employer. After three years, we start using the record of your past earnings to determine your contribution rate. We call this the two-year look back. During the two-year look back, we look back at your earnings from two years before and use that amount to determine your contribution rate for the current year. Watch the video below for more information. If you have questions about Tier 6 contributions, please contact us. As a Tier 6 member, the contributions you make toward retirement are based on your earnings. This means your contribution rate could change from year to year depending on how much you earned in previous years. If you’re a Tier 6 member with three or more years of membership in NYSLRS, we determine your contribution rate using a method called the two-year look back. This means we look back at your earnings from two years before. We use those earnings to determine your contribution rate for the current year starting April first. So, we look back to what you earned from April first to March thirty-first two years ago, and use those earnings to determine your contribution rate. This will be your contribution rate for the entire year until next April first, when we’ll do the look-back again to determine your new rate. Remember, as a Tier 6 member, your contribution rate could change each year depending on your earnings. 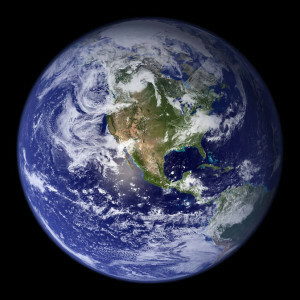 You may not see a change right away, but over time, you could wind up contributing more or less than you did before. If you have any questions about Tier 6 contribution rates or your benefits, visit our website or contact us. Thanks for watching. Content last revised April 1, 2015. This entry was posted in General News, Members, Videos and tagged benefits, contribution rate, Contributions, defined benefit plan, ERS, Information is the Key, know your benefits, members, New Members, New York State & Local Retirement System, NYSLRS, PFRS, retirement plan, Tier 6, Two Year Look Back, Video on April 1, 2015 by NYSLRS.